Killer Colombian Funk! Phirpo Y Sus Caribes were a mysterious band from Medellin who recorded this blistering cover version of Fela's 'Let's Start' - an Afro Latin Funk masterpiece! (This track is exclusive to the 45) Lito Barrientos - originally from El Salvador - toured Colombia from the 50's to the 70's, where he produced this Cumbia classic that gets people out of their seats wherever its played! 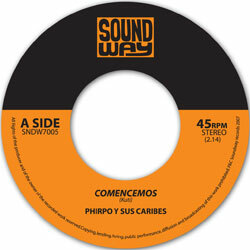 (Also featured on the Soundway Album 'Colombia! the Golden Years of Discos Fuentes, the Powerhouse of Colombian Music, 1960-1976'). Deodato live in Paris tonight and mixed on ParisDJs.com!